SO, Dakota not only knows how to open all of the doors in our house (and out of the house) but she ALSO knows how to climb a ladder! I went up the 8' ladder to check on the progress on the roof. I was not up there 1 minute and Dakota decided she should be up there with me! I looked over at the ruckus at the ladder and low and behold Dakota's head popped up at the top rung of the ladder! She looked very concerned that maybe she didn't realize what she'd done. She looked back at the ground, anxiously. I had to pull her all the way up, so she didn't fall trying to back down the ladder. My husband backed his truck up against the building, got a 2'x12' and propped one end up against the rooftop & the other in the bed of the truck. Then the act of trying to get her to go down the 2x12! NOT happening..... My husband tried to carry her down the ladder, that didn't work - she was too heavy and too scared for him to be able to get good enough footing on the ladder. I put her on a leash and got 1/2 way down the ladder next to the 2x12, to keep her from falling off, and my husband had to push her down. She slid down the 2x12 on her tummy into the bed of the truck. I wasn't a great amount of help to my husband since I was laughing so hard at the idea that she climbed up the ladder! He didn't see the humor in it. I'm banned from the roof! ... I didn't realize how determined she was. I am SO thankful she didn't get hurt. I feared (between my giggles) her falling and breaking a leg.... that would have been AWFUL. 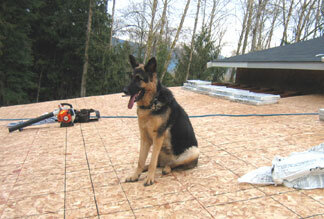 Thanks Tracy, for sharing the story of Dakota, the German Shepherd on the roof with all of us!